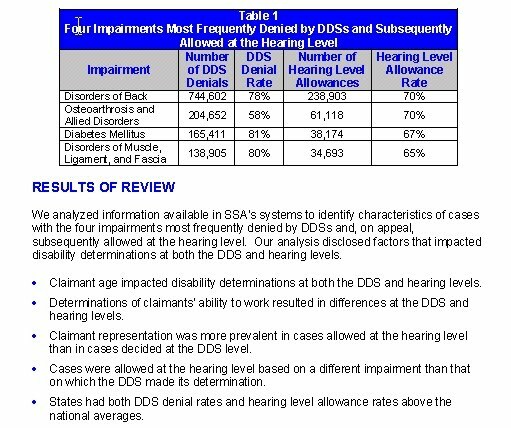 The Office of the Inspector General release a report this month regarding claimant medical impairments that have the widest gap between being denied at the DDS level (on initial application and reconsideration) and subsequently qualifying for benefits at the Administrative Law Judge level. This report is of particular interest for a couple of reasons. First, I suspect that this report contains no surprises for any practitioner who regularly takes disability cases to hearing. Secondly is some assumptions that may be made about the nature of the illnesses. Disorders of the back, diabetes mellitus, and disorders of the muscle and fascia are denied approximately 80% of the time at the initial and reconsideration levels, yet when argued at a hearing, they succeed between 65% - 70% of the time. What causes these cases to succeed at such an impressive rate? Is it the age of the claimant? Is the functional capacity with which the Claimant is left? What becomes clear later in the report is a "deny 'em all and let ODAR sort it out" mentality. Only 30-40% of cases appeal beyond the original denials. Though reasons for lack of an appeal can be attributed to an absence of severity, there also may be anger and discouragement with the government. 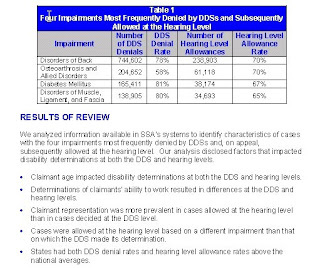 Certainly the first two levels of the evaluation of a Social Security case are to screen out cases that do not warrant benefits, but a disparity as shown in the report below must be addressed. The question is how best to do so? The answer is stronger analysis of the Claimant's functional capacity at the initial levels. A developed, published, reviewed, and measurable framework around which to evaluate capacity to work would at least allow those adjudicating cases at the early levels to not rely on a blanket denial of such cases to screen out the malingerers. As a practitioner who has taken numerous patients to hearing on cases such as these, it is clear to me that in many, many the hearing serves little purpose other than to "let the judge have a look at them." This not only hurts the credibility of the SSA in general, but destroys the good will of an organization that is underserving those whom it is charged to support.